I created the smart app but it is still not showing in the Smartthings app. I have the V3 Samsung hub with the newest app. It’s not showing up after enabling oauth and publishing it to me. first, you need to publish the two items at the top of the image you posted. Looks like you made changes but didn’t publish the changes so they will not take effect until you publish them. 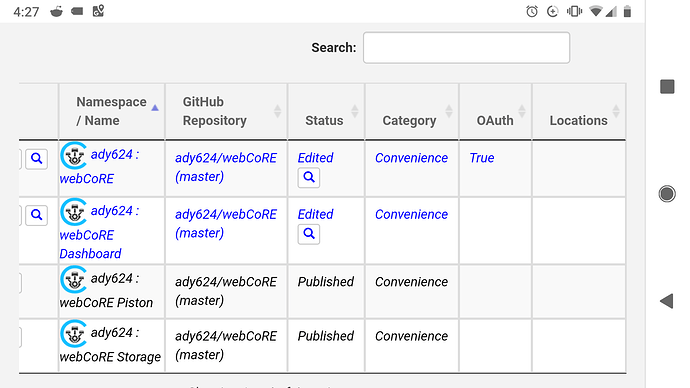 second, install the SmartThings Classic app, go to MarketPlace > SmartApps > My Apps and install an instance of webCoRE, then you can return to the SmartThings (Samsung Connect) app if you want. BUT, as an FYI…webCoRE does not work with Smart Home Monitor in the new app nor does it work with Location Services there. It only works with SHM and presence sensors in the Classic app.